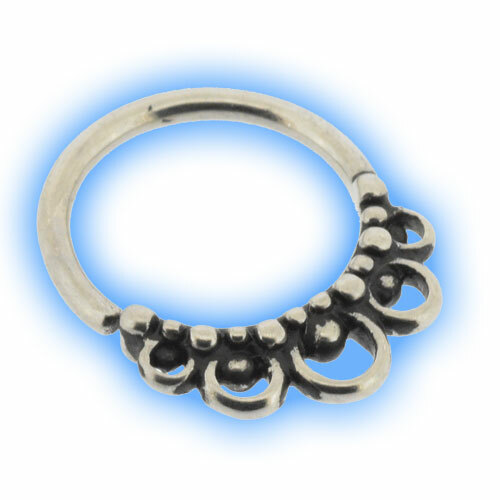 This is an unusual boho easy fit seamless ring which features an unusual hoop and dot design. It is made out of cast steel which is annealed to enable easy opening. The ring is availabel in 0.8mm (20g), 1mm (18g) or 1.2mm (16g) so it is great for many ear piercings and also very popular for septum piercings. Love it! I was looking for something like this! Amazing quality and super fast shipping!! "First order will turn into many more, very fast service and nice quality jewellery, my only complaint is that I now don't have enough holes in my..."
"I have bought all my jewellery from Jo. I have always had super fast delivery, and they are always quick to right any problems, if they come up...."